Is your dog experiencing eye redness, cloudiness or dilated pupils? Is he squinting a lot or tearing up? Could it be glaucoma? Let’s learn the basics about glaucoma in dogs — including the symptoms, different types, diagnosis and treatment. First, what is glaucoma in dogs? Glaucoma in dogs can lead to vision loss or even eye removal. Photography ©Page Light Studios | iStock / Getty Images Plus. Glaucoma in dogs is a serious eye disorder. Left untreated, glaucoma in dogs can lead to loss of vision and might require removal of the affected eye itself. Glaucoma means elevated pressure in the eye. If the fluid within the eye doesn’t drain the way it should, it causes pressure to build up, increasing pressure on the optic nerve. Eventually, the optic nerve becomes damaged, which may lead to vision loss. What are the symptoms of glaucoma in dogs? Glaucoma in dogs is not always easy to recognize, especially early on. You might notice eye redness or cloudiness, a dilated pupil, or excessive squinting or tearing. Advanced glaucoma in dogs is often more obvious as the affected eye starts to bulge. Glaucoma in dogs can also cause acute vision loss, but you might not realize your dog has lost vision in one eye. “This is often not noticed by the pet owner because the pet compensates so well with the other eye, so vision loss in one eye is not obvious,” Dr. Beaumont says. There are two types of glaucoma in dogs: primary (also called inherited) and secondary (also called acute). How is glaucoma in dogs diagnosed? Don’t brush off watery or red-looking eyes as “no big deal!” Whenever you notice something wrong with one or both of your dog’s eyes, see your vet right away. Do not put off an appointment — waiting too long could lead to permanent vision loss. Additionally, since glaucoma and other eye disorders may be extremely painful for your dog, you want to get him treated as quickly as possible. How is glaucoma in dogs treated? If your dog has glaucoma, your vet will prescribe special eye drops to lower the intraocular pressure. Sometimes, surgery might be necessary. In cases where the pressure cannot be controlled with medications or surgery, your vet may recommend removal of the eye. 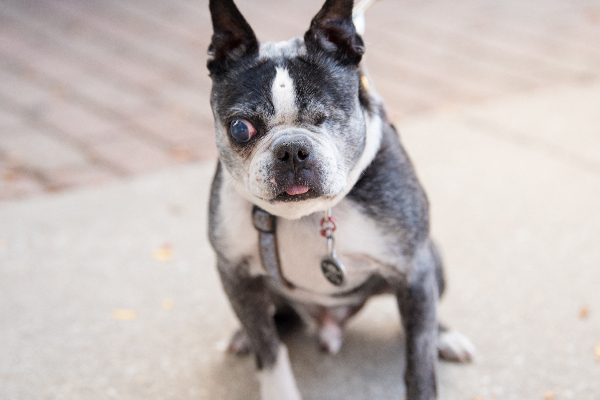 This might sound extreme, but most dogs are already dealing with vision loss by this point and are already adjusting to using one eye to see. Thumbnail: Photography ©IvonneW | iStock / Getty Images Plus. The post Glaucoma in Dogs: Symptoms, Diagnosis and Treatment appeared first on Dogster.